Silver Star single-fold ramps from Pride® offer a reliable solution for transitioning curbs, thresholds and other obstacles. They can accommodate a weight capacity of 600 pounds and are available with 2 difference surface options. 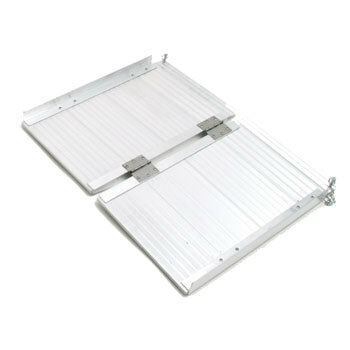 Plus, lightweight Silver Star Ramps are easily portable, making them ideal for home and travel. Single-fold ramps from Silver Star…For home and travel. 2' Product Weight: 12 lbs. 3' Product Weight: 17 lbs. 4' Product Weight: 27 lbs. 5' Product Weight: 30 lbs. 6' Product Weight: 35 lbs. Product Weight: 12 to 35 lbs. I really like the rollater cover, a little pricey, but what I wanted.